Uglyworld #1817 - Luckiers Tattoo - (Project Cinko Time - Image 26-365), a photo by www.bazpics.com on Flickr. Lasts night Baz tellereds the whole gang overs here in the cookie cave to be on our besterests behaviours as Mireille had nots one buts two examers to sitters this morning! Bwah, how craziers is it to sitters and examer on a Saturdays, and even more craziers to sits two of them on a Saturdays! Anyways, as we couldn't watchers telemavision or be our normallers noisy selfs we thinkereds hard about what we could does to bringers Mireille some gooders luck today in her examers. 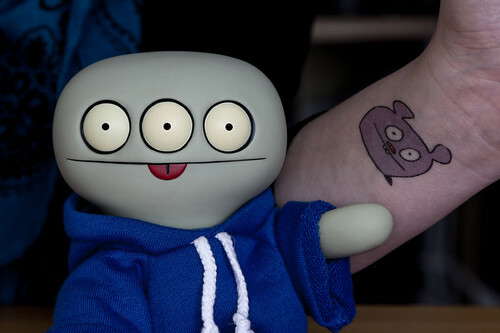 I hads the brainwaver to gives her some uglies luck to takes along with her, in the forms of a tattoo of my gooders buddy Trunko. A biggers thanks you must goes out to Daniela and my littlerests buddy Fabian who sendereds the tattoos to Mireille, I is sure they will be happiers to sees them puts to gooders use! Thankfullies now that the examers is over we can now acts like a bunch of complete mentallers again, wooohooo!! !